It's not that often that the private sector turns to the political arena for inspiration. But there's one remarkable political skill that businesses should note. There may be no better example of strategic thinking and execution than that demonstrated by a major U.S. political party during an election campaign. For the political strategist tasked with the election of a single candidate, strategic thinking is vital but meaningless without execution. The breakneck campaign that follows strategy formation is where the political strategist proves his or her worth. Is Your Strategy a Springboard for Success? At its core, strategic planning is the generation of ideas and opportunities that will bridge the gap between the current business and desired future business. The product of a great strategy should not be measured by the encouraging feeling that often results from strategic discussions. While enthusiasm for a strategy is critical, just like a sun tan, that warm glow will disappear quickly. Executive decision making and, most importantly, action are essential for advancing shareholder aspirations. This year, “The 2014 FA Insight Study of Advisory Firms: Growth by Design” attracted more study participants than any other industry-wide benchmarking study. New ground was covered in the area of strategic planning, revealing the practices of the industry’s most successful firms. This third article of our four-part “Growth by Design” series provides insight into how firms can better convert strategic thinking into success (see past articles at the Growth by Design homepage on ThinkAdvisor.com). 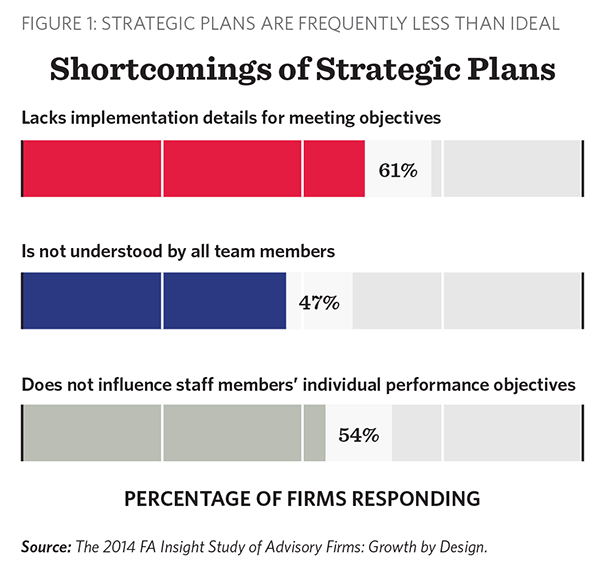 In 2014, 85% of advisory firms surveyed indicated that they have developed a strategic plan. For firms generating over $4 million in revenue, a group we call the Innovators, this number increased to 94%. Despite strong adoption of strategic planning, effectiveness is limited. Of all firms that have a strategic plan in place, 61% lack the necessary detail that will enable implementation (see Figure 1). In addition to the lack of implementation planning, a sizeable percentage of firms indicated that not all team members understand the strategy. Furthermore, for a majority of firms, team member performance objectives are not linked to the strategic plan. For these firms, strategic planning efforts may be in vain, with business-as-usual a predictable outcome. To achieve success, political strategists vigorously assess competitors, anticipate changes in the political landscape and plan for contingencies. They must also identify and accentuate the positive attributes of their candidate to differentiate him or her from competitors. This external and internal assessment can unearth the opportunities that lead to a competitive advantage. Business strategy is much the same. For an advisory firm, market-based factors (e.g., legislation, access to talent, changing competition) must be combined with an assessment of business capabilities to reveal opportunities. In practice, however, much of the heavy lifting in strategic planning appears to be sidestepped. When it comes to setting strategic objectives, the typical advisory firm demonstrates a greater focus on financial milestones with less attention paid to the leading indicators of success (see Figure 2). The four most common strategic objectives set by advisory firms are all lagging indicators. While they are critical measures of success, this result suggests a shortfall in the planning process. Achievement of revenue, asset or profitability objectives depends on a range of other activities taking place in the firm. Non-financial objectives in areas of human capital, operations and clients must combine to support financial success. The industry’s Standout performers demonstrate the importance of non-financial strategic objectives to drive superior results. As background, FA Insight defines Standout firms by two key metrics: revenue growth and income generation. By excelling in these areas, Standouts demonstrate the ability to build and sustain enterprise value. Based on a blended ranking of these two metrics, firms in the top 25% of each development stage are deemed Standouts. 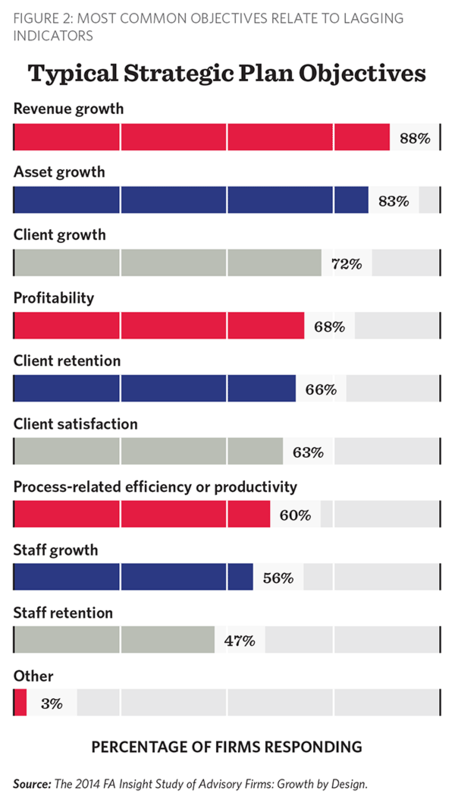 Across all development stages, the Standout firms cite their ability to deliver a superior client experience as a primary factor in driving their recent growth. Operational efficiency along with marketing and business development capabilities were also ranked highly. The ability of the Standout firms to drive profitable growth through a superior client experience is most likely the result of non-financial activities. For example, a value proposition that resonates with target clients, as well as process, technology and service advances, enable a superior client experience. The financial outcomes, such as revenue growth or profitability, are achieved through emphasizing these non-financial initiatives. Just three years ago, the term “robo-advisor” was largely unheard of in the industry. In an ever-changing market, firms cannot expect to simply do “more of the same” to achieve sustainable growth. In recognition of this, advisory firms have signaled a shift. 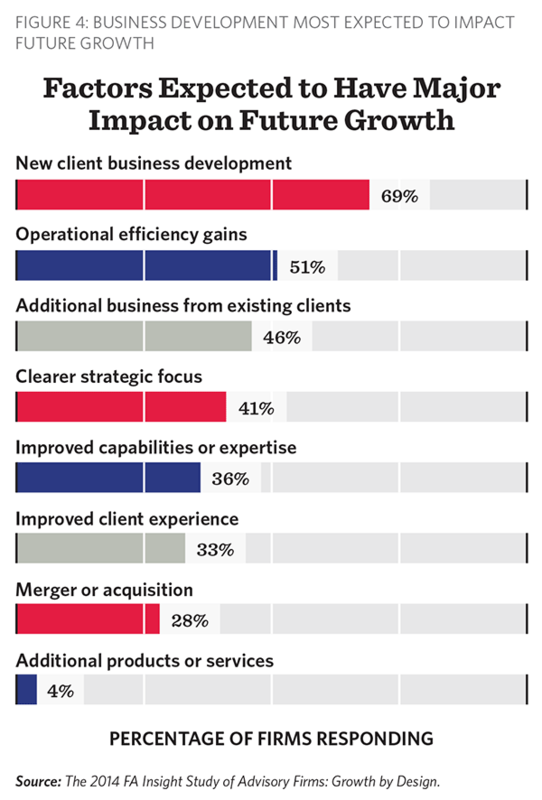 According to survey results, business development will take on far greater prominence for the typical advisory firm over the years ahead (see Figure 4). Nearly 70% of advisory firms expect new business development to have a major impact on their future growth. This compares to just 43% of firms who indicated that their business development strategy was an important contributor to their recent growth. Targeted business development strategies should be an integral component of any robust strategic plan. However, for a majority of advisory firms, both strategy and implementation in this area are limited. In 2014, just 13% of firms reported their marketing plan to be effective. Half of all advisory firms do not have a marketing plan at all. For those seeking to grow through more aggressive business development, new capabilities may be required. FA Insight defines sustainable-growth firms as those achieving strong growth without encountering any of the negative impacts of growth. The 19% median revenue growth in 2013 for sustainable-growth firms was nearly four percentage points higher than their peer firms. For those firms looking to establish greater strategic planning skill, the sustainable-growth firms may set the best example for what is possible. When it comes to strategic planning, this group demonstrates a greater ability to convert their plans into action. Team members have a greater awareness and understanding of the firm’s strategic plan relative to other firms. Furthermore, implementation details for how to meet plan objectives are more likely to be in place. Sustainable-growth firms follow a similar approach with their marketing efforts. They are more likely to have a marketing plan and more likely to report their marketing plan to be effective in attracting new clients. To ensure successful plan implementation, the sustainable-growth firm is more apt to have an individual dedicated to marketing oversight. It is important to recognize that the distinction between sustainable-growth firms and others is not necessarily the quality of their strategic thinking. In many cases, it is their ability to convert strategic thinking into action that creates shareholder value. Whether the focus is an election campaign or business growth, even the savviest strategist will fail without implementation. In our own experience working with advisory firms to develop growth strategies, those who excel demonstrate three key attributes: leadership, action and accountability. In addition to focusing on implementation, firms are encouraged to explore their capabilities and their operating environment to identify new opportunities that will lead to success. Financial objectives are important but alone are inadequate. Instead look to the leading indicators of business success to drive change and performance. For more guidance on how this can be achieved, firms are encouraged to contact FA Insight directly. Our fourth and final article in the 2014 “Growth by Design” series will focus on how to better realize growth potential through marketing and business development. For many advisory firms, marketing is the most underdeveloped of all business capabilities. FA Insight will share study highlights including the marketing practices that distinguish the industry’s Standout firms from their peers.